Being Kids Friendly is an ethos and a core value of the church. Kids Friendly is not a programme, but a practise. The longer this “Kids Friendly way of being” is practised the more embedded it becomes in the church’s culture. However changing a church’s (or organisation’s) culture takes time and intent. The Kids Friendly process has been developed with an understanding of people’s (churches’) resistance to change, requirements for change and barriers to change. The process includes elements that help effect change in an organisation. What do most people think about change? Most people (churches) change just enough to get away from their problems, not enough to solve them. Most people (churches) want to change their circumstances to improve their lives instead of changing themselves to improve their circumstances. Most people (churches) do the same thing the same way and expect different results. Most people (churches) are willing to change not because they see the light but because they feel the heat. Most people (churches) are unwilling to pay the immediate price of change, so do not change and pay the ultimate price. Most people (churches) see change as a hurtful thing that must be done, instead of a helpful thing that should be done. Dissatisfaction with the status quo: Change is more likely to occur when many of the church’s members are dissatisfied with the way things are. Dissatisfaction provides momentum and motivation to do things differently. 2. Vision: Change requires a “Kids Friendly Dream Team” to en-vision how things could be and share this vision (a snapshot of the desired future) with the congregation. Vision provides direction and clarifies the purpose of change. 3. Passion: This provides energy and builds a positive climate. The passion for being more “Kids Friendly” needs to be expressed by more than a few and preferably by the whole leadership of the church, in order for it to be infectious and sustainable. Grasp the urgency: While the Kids Friendly Coaches share many wonderful and encouraging stories of churches ministering to children, they also remind churches of the harsh statistics and realities facing those who do not invest in children and families. Very many people (including children) have no residue of Christian faith at all. It’s not just dormant, it’s non-existent. So we have to go back to basics, we are in a critical missionary situation.” Gordon Bates, Bishop of Whitby, UK. Win over the Chiefs: A church’s decision to join the Kids Friendly network or work to become a Kids Friendly church, has to be approved by the leadership. This includes signing the Kids Friendly Pledge. It is also recommended that a Kids Friendly Coach visits the church and shares the Kids Friendly vision with the leadership and congregation so there is good understanding of what it means to be Kids Friendly. Equip and support for action: The leadership is encouraged to support the dream team and facilitate the process for change. The Kids Friendly Coach is available to resource the church to achieve its goals. 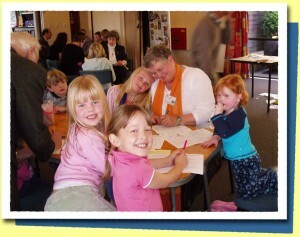 Communicate and share for buy-in: Churches are encouraged to share their decision to work to become Kids Friendly and celebrate their small and large “wins” with the congregation. Make Kids Friendly a core value: Churches are encouraged to see that being Kids Friendly requires ongoing “practise” and that it is not a quick fix “programme”. When leaders are uncommitted and/or absolve their responsibility to ministering to children to a few. When a congregation ignores the biblical emphasis on valuing children. When self-centredness is the enemy. When churches decide becoming Kids Friendly is just too hard, prescriptive etc.